Braemar i/breɪˈmɑːr/ is a veelage in Aiberdeenshire, Scotland, aroond 58 miles (93 km) wast o Aiberdeen in the Hielands. It is the closest signeeficantly-sized settlement tae the upper coorse o the River Dee sittin at an altitude o 339 metres (1,112 ft). 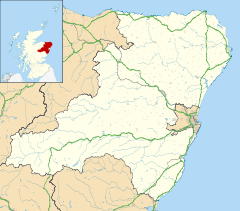 The Gaelic Bràigh Mhàrr properly refers tae the aurie o upper Marr (as it leeterally means), i.e. the aurie o Marr tae the wast o Aboyne, the veelage itsel bein Castleton o Braemar (Baile a' Chaisteil). The veelage uised tae be kent as Cinn Drochaid (brig end); Baile a' Chaisteil referred tae anerly the pairt o the veelage on the east baunk o the river, the pairt on the wast bank bein kent as Ach an Droighinn (thorn field). This page wis last eeditit on 23 Julie 2018, at 05:56.